Arcade games are a well known source of entertainment. Not only that they offer fun, but bring us back childhood memories as well. 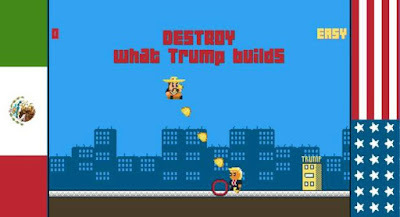 That is why today we have a full review of a new arcade gaming app, called Taco Trump Down. The creator designed it in a retro style, with fun and satiric characters, with Nintendo-alike engaging sounds and music and of course, with great gameplay. Besides, it can be played on both Android phones and tablets by children and adults too. The gameplay of Taco Trump Down features an authentic storyline. Basically, Trump has build a wall to keep Mexico out and the only hope for making Mexico great again is the Mexican Superhero Taco Man. This is your character and your main goal is to destroy everything that Trump builds, from towers, to walls, election centers, steak houses and much more. 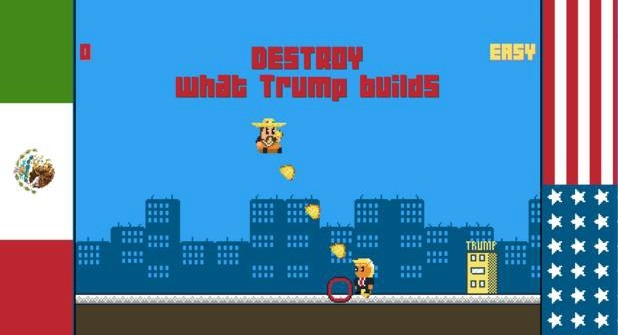 Tap on your screen in order to throw your tacos towards the buildings while you’re flying in the air above, don’t left anything undestroyed and try to avoid from the flying balloons and steaks coming from Trump’s buildings. From time to time Taco Man has to collect some jalapenos and dump on Trump. You can see how exciting it sounds, so don’t hesitate, get it today for free from Google Play!